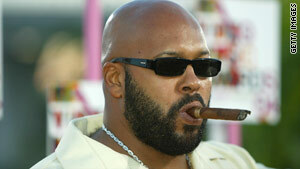 Suge Knight, founder of Death Row Records, has had numerous scrapes with the law. (CNN) -- Rap music mogul Marion "Suge" Knight was arrested early Thursday on suspicion of pointing a gun at a man, authorities in California said. Knight, 45, was charged with assault with a deadly weapon involving a firearm and with driving under a suspended license, Los Angeles police told CNN. According to investigators, an unidentified man reported that Knight aimed a weapon at him late Wednesday evening. Knight, who co-founded Death Row Records, was later found driving a Cadillac Escalade in the city of Gardena, in the greater Los Angeles area, police said. He was arrested without incident just after midnight, authorities said. Knight was booked at the Los Angeles Police Department Metropolitan Jail and remained in jail early Thursday afternoon in lieu of $60,000 bail, authorities said. The investigation continues, Los Angeles Police spokeswoman April Harding said. Knight's attorney declined to comment. "I have not spoken to him," lawyer Marc Brumer told CNN. "I cannot comment until I've spoken to him." Knight has had previous run-ins with the law. He served several years in prison for violating parole on assault and weapons convictions. Knight was with Tupac Shakur when the rapper was shot to death in Las Vegas in 1996. The slaying has not been solved. The producer founded Death Row Records in 1991 with rap artist Dr. Dre, and the label grew to represent some of the biggest names in the music industry, including Snoop Doggy Dogg and Shakur. But Shakur's death, public feuds between Knight and some rappers, his imprisonment in the late 1990s and desertions by Dr. Dre, Snoop Dog and others led to the label's ultimate demise and bankruptcy proceedings in 2006.